A Portland & Western freight passes the First Avenue underpass on the Lafayette Street trestle Wednesday. 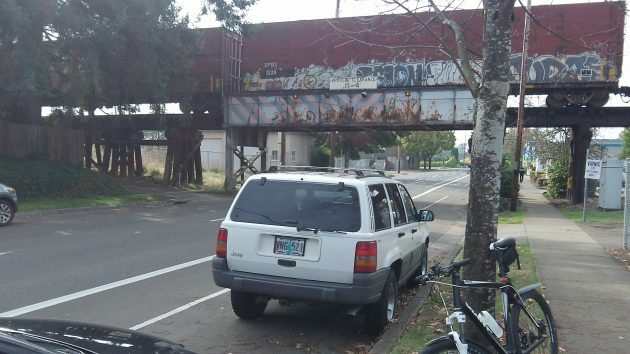 Note that the trestle warning lights are practically invisible. 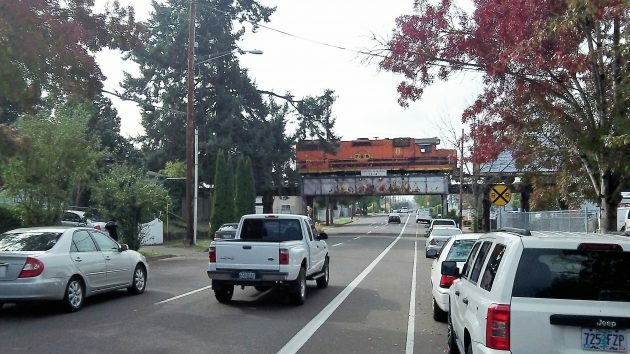 Hoping to cut down on the number of times that trucks get crunched by the railroad trestle on First Avenue, the Albany city administration has decided to upgrade warnings to give drivers a more emphatic heads-up. City Manager Wes Hare told the council Monday what he thought could be done, and the council had no objections. Council members had previously complained that the railroad’s own warning lights on the bridge were far too dim and could hardly be seen even though they take turns flashing every few seconds. There also had been calls for the railroad to repaint the bridge a brighter color so it would be more noticeable to drivers on the street below. The warning chains are about a block upstream of the overpass on First, a one-way street. They’re supposed to make a racket when they hit the top of trucks or trailers taller than the 11-foot, 4-inch clearance posted on the bridge. Council members have theorized that by the time the chains hit something, the noise is behind the cab and the driver either is puzzled by what it means or does not hear it at all. Bigger weights should make more noise. The clearance warning blends with the background of graffiti on a stopped train. Keep in mind citizens, we are “crossing” R/R property not the other way round. With no penalty to prompt the R/R to do anything to the trestle they maintain their late 1800’s right-of-way land grant privilege! It’s “our” problem, not theirs.